On 6th March 2017, 15 ACE Apprentices will celebrate their graduation after completing a 4-year Modern Apprenticeship with the company. 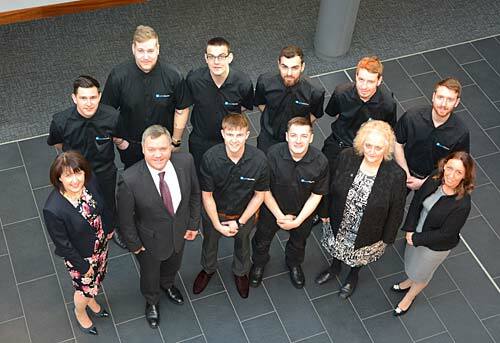 The ACE Winches Apprenticeship Programme was set up over 20 years ago, to provide a succession of young talent to the company. The company has been working in collaboration with ITCA, spanning over 15 years, in the delivery of its three Modern Apprenticeship Programmes in Craft, Technical and Business. Over the last 20 years, ACE Winches has recruited directly from schools and colleges with over 100 apprentices having completed or in the process of completion. ACE Winches continues to fully support those Modern Apprentices who wish to pursue further education by funding additional studies. The company also has in place an established Engineering Graduate Scheme, accredited by the Institute of Mechanical Engineers which has seen 25 university graduates go through the scheme. In addition, the company offers a Trainee Programme aimed at part-qualified young people who have previous industry experience, fast-tracking them to tradesman level. ACE Winches was the first organisation worldwide to achieve the Investors in Young People (IIYP) in July 2014, the only people management standard that focuses on an employer’s recruitment and retention of young people. The company continues its commitment to engaging and developing young people by supporting work placement experience, modern apprenticeships, trainee and graduate schemes to onboard and develop future talent to support the company.